Set in the 11th century, a young English boy Rob (Tom Payne) with a gift for ‘seeing’ a person’s impending death, embarks on a journey of medical apprenticeship with the mud-caked town Barber (Stellan Skarsgård), after the tragic death of Rob’s mother due to a mysterious but fatal ‘side sickness’ (now known as appendicitis). 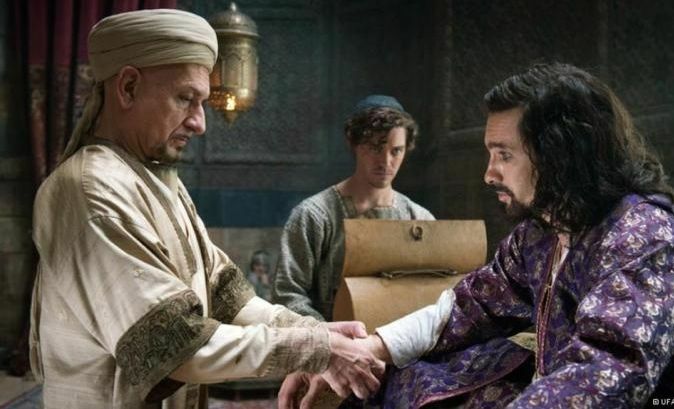 The Barber, who is more or less the medieval sawbones version of Hagrid, has an enthusiastic but misguided preference for questionable amputations over scientific, medical analysis, which eventually leads Rob on a dangerous journey across the desert to the Orient to study under the great Persian philosopher Ibn Sina (Ben Kingsley). Rob’s resentment for religious stifling of scientific progress comes from the local priest forbidding any medical intervention, since it is not the true work of God. 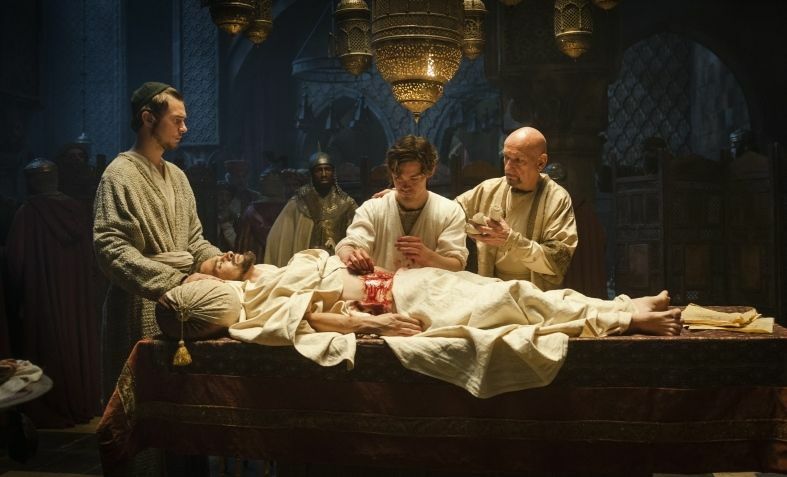 At a time where medicine is mistaken for witchcraft, the film addresses the hindrance of religious intolerance on medical advancement, and that goes for all three Abrahamic faiths: Islam, Christianity and Judaism. Rob in fact disguises himself as Jewish (even performing his own squeeze-your-legs-together circumcision) in a place where Christians are even less welcome than Jews. The story is indeed rich, if not over-ambitious, as it juggles with the deeper problems of religious road blocking and extremism, against an immaterial ‘forbidden love’ sub plot between Rob and Spanish beauty Rebecca (played by Emma Rigby, who has certainly come a long way from her Hollyoaks days!). One thing I struggled with slightly was the way the film portrayed Rob’s gift. If anyone’s played GTA, then Franklin’s special skill of driving in slow motion so as to avoid high-speed crashes is basically how The Physician portrays Rob’s talent. Everything slows right down, with Rob’s wide eyes staring in horror at the unfortunate individual before him, before it snaps back to normal time, and he rushes off. It wasn’t a bad way of doing it, just a bit clumsy and odd. I’m still not sure how I feel about it. The script also relies on emotive outcries and lacks subtlety; especially as one major positive about the film is that it’s so full of enchanted wonder, something notably lacking in most films of the last decade. Kingsley’s mysterious, warm presence is instantly charismatic, and coupled with Rob’s overeager but generous heart, together are great to watch. The film also benefits from excellent widescreen shooting and graphics, in particular the desert and sandstorm sequence. Despite sometimes oversimplifying the topics it grapples with, The Physician is immersive and opens up an important debate over the interaction of religion, culture and medical advancement. The Physician is released on DVD through Arrow Films on Monday October 5th.